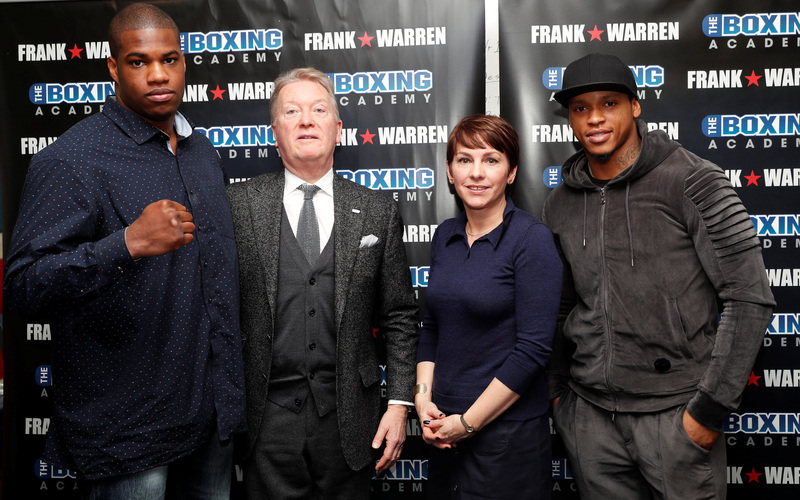 Hall of Fame Promoter Frank Warren paid a special visit to The Boxing Academy in Hackney yesterday along with rising British stars Anthony Yarde and Daniel Dubois ahead of their fights at London’s Copper Box Arena next Saturday. The Boxing Academy offers an alternative education pathway for students who are at risk of exclusion, or who have already been excluded, from mainstream education. Their mission is to offer high quality alternative education to even the most hard-to-reach young people, realised through the discipline, ethos and culture of boxing. Warren, Yarde and Dubois were joined by The Boxing Academy’s Principal Anna Cain to give a talk on the benefits of boxing to the media and students in attendance before both fighters laced up their gloves and put on a knockout training session. “We thought it would be appropriate to come down here today with two of our young stars Anthony Yarde and Daniel Dubois,” said Warren. “Boxing is a catalyst to help educate youngsters and give them some direction in their lives. The work that Anna and her staff do here is absolutely fantastic and it’s a real pleasure to be here today to meet you all. “We are thrilled to welcome Frank, Anthony and Daniel to The Boxing Academy,” said Principal Cain. “It is no surprise that people in boxing get the point of this school, you don’t have to be a boxer for the sport to have a positive effect on your life. Boxing is a force for good. It’s incredibly positive. From our point of view, we love the fact that we can be a proper school with the ethos of a boxing gym. “Sport has always been a part of what I’ve done day to day,” said Dubois. “I’ve always been around a gym – I was very energetic as a kid and that needed to be controlled in a positive way. I was five when I started boxing as a little nipper. As you go on you get more addicted to it and you want to go further and further. To find out more about The Boxing Academy and the work they do visit www.theboxingacademy.co.uk. On December 9th Light-Heavyweight ‘Beast’ Anthony Yarde (13-0, 12 KOs) defends his WBO Intercontinental and European belts against Nikola Sjekloca (32-4-1, 11 KOs) while Heavyweight sensation Daniel Dubois (5-0, 5 KOs) aims to continue his KO streak when he faces former Anthony Joshua opponent Dorian Darch (12-5-1, 1 KO) in his sixth contest.